KARAN JOHAR is one of the leading directors, producers and writers in the Hindi film industry. He is the son of a much-respected film producer Yash Johar who set up Dharma Productions in 1976. Karan took over his father s legacy following his death in 2004. Over the years he has built Dharma into a powerful influential and flourishing entity. Karan began his tryst with filmdom in 1995 as an assistant to filmmaker Aditya Chopra on the sets of Dilwale Dulhania Le Jayenge 1995. Subsequently Karan made his debut as director with Kuch Kuch Hota Hai 1998 which went on to become a blockbuster. He has directed six major films and produced over twenty all starring some of the biggest names in Bollywood. He recently made his first appearance as actor in Anurag Kashyap’s Bombay Velvet in 2015. I didn’t think twice when I pre-ordered the book. After all, I am an ardent fan of Karan Johar – the director, producer and TV host. I have watched all his movies at least four times (I say four because I have watched Ae Dil Hai Mushkil only four times as of now). Disclaimer: I have pledged to the words that I will not be biased as I review it. The fan in me is shunned in the dark as I type this! To begin with, the title will surely draw reader’s attention. After all, most of us would have read or else would have Vikram Seth’s bulky A Suitable Boy in their reading shelf. Karan Johar’s sexual orientation is one of the most talked about aspect. The title in a way hints that it could end all the speculations around it. Does the book actually answer that? Well, I don’t want to give away anything! 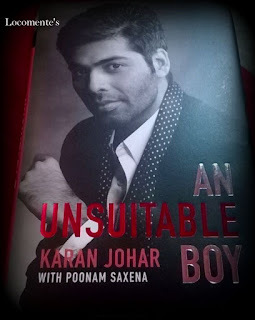 The cover page has Karan Johar himself with twinkling eyes and the pout. And bang! We instantly connect to the book in the same way we connect to his movies. The book thoughtfully describes how KJo’s childhood has been. His never ending appetite, emotional turmoil of being single child and low self-confidence is extensively discussed. As we flip through those pages, it walkthroughs us the glitz and glamour of Bollywood, many friendships that were made and few that were lost. It also describes what inspired the director to write the stories which eventually turned out to be blockbusters. It takes the reader a step closer to him and to the opulence which had always seemed to be surreal. The emotional element and the honesty keeps the reader engrossed to the book. The author also talks about why Amitabh Bachchan, Shah Rukh Khan, Aamir Khan and Salman Khan are the superstars that they are. The book is more on speculation because the author has chosen not be open about his sexual orientation. But more interesting themes like relationships with parents, peers and actors are mentioned. This makes the book more valuable than anything. Yes… If you like KJo’s works, admire him for being multi-facet or have a good fun-time watching his show Kofee with Karan. This book will surely take you one step closer to the person that he is. It will also give a glimpse what probably inspired him to make the movies he made. And of course, it unapologetically calls out that life of people in the glamor industry need not be so glamorous and colorful as we presume. Over all, like we do watching his movies, we would laugh, empathize and feel good. I'd surely read this. Love picking the brains of the greats. I don't watch his movies . Koffee with Karan I do ! I cant wait to get my hands on this one! Thanks a lot dear ! !